We have recently completed researching an independent walking holiday for 2010 along the legendary Camino de Santiago, also known as the Way of St.James. This extraordinary journey is undertaken by thousands of people – some pilgrims and others keen walkers – every year, and is becoming increasingly popular. It will be especially popular in 2010 which will be a Holy Year, when St.James’ birthday falls on a Sunday. Some people begin walking in Germany or Italy, and follow routes all the way through France walking for months on end, although we will be starting slightly closer in the classical city of Leon, spending 10 nights walking through Castilla and Leon and the green valleys of Galicia. Walking the Camino is an extraordinary experience. There is an immediate and profound camraderie between walkers along the trail, and every day you fall into step with fascinating people from all over the world. Add to this the varied and charming hotels we have selected, the beautiful countryside and the delicious Galician seafood and you have a fantastic trip. Nearly all walkers on the trail have a ‘Pilgrim Passport’ whether they are pilgrims or not. This is a document that you can fill with colourful passport stamps in every bar, restaurant, hotel and many churches and monasteries en route which makes a wonderful souvenir, and which will qualify you for a certificate from the Pilgrim Office in Santiago as proof you have completed the Camino successfully if you wish to collect it. Look out for it in our 2010 brochure! 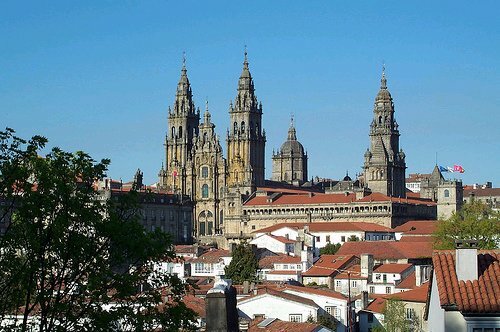 Santiago de Compostela is so called because, so the story goes, a local hermit was led to St James’ mortal remains by a star above a field. Field in Spanish is ‘campo’, star is ‘stella’, and St James is ‘Sant Iago’. This has since evolved as Santiago de Compostela.